I ordered a bunch of American saisons at the beginning of the year and planned on doing a springtime saison tasting party. Spring came and went, so I planned for summer. I added to the bottle collection over the following months with anticipation building for the most ultimate of all ultimate beer gatherings. In furtherance of my saison party prep, I brewed a ten gallon batch of saison and split the fermentation between two saison yeast strains so we’d have a homebrew representation. And then summer passed (I showed a surprising amount of self-restraint not opening that ever growing stash of farmhouse style brews). With cold weather looming, we decided to dust off the bottles, push the kegerator outside, buy a shitload of olives and cheese and get the party started. Picked up a lot of dog poop. Eagerly awaiting a dropped chip. 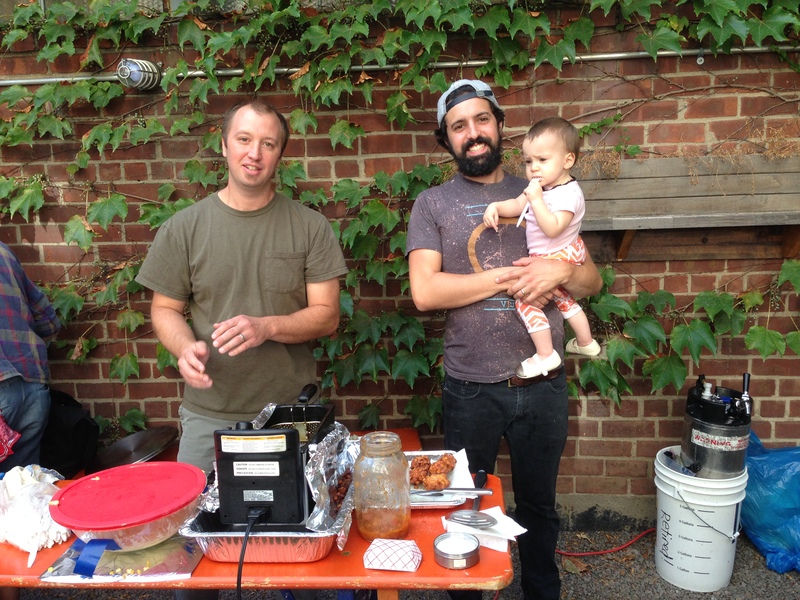 Much fun was had, the weather was beautiful, and plenty of saisons were tasted. Some standouts for me were the Boulevard Tank 7 (and Brett version), Logsdon Seizoen (and Brett version), Great Divide Colette, and Pretty Things Jack D’Or. 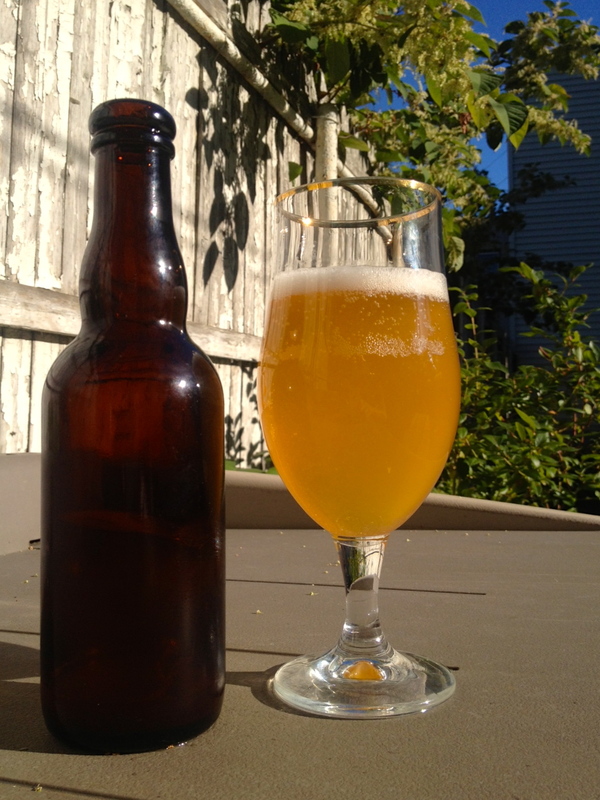 My homebrewed versions held up surprisingly well, and I’ve included some tasting notes below. For these beers, I kept the grainbill pretty standard for a saison using 90% pilsner malt, 5% flaked wheat, and 5% table sugar (added to the fermentor). As is often the case with my I’m-a-dad-now abbreviated brewing schedule, this batch performed double duty as part of a single-hop saison experiment for my Brooklyn Brewsers homebrew club. I chose Crystal as the single hop for it’s noble hop similarities (most classic saisons use noble hops), making sure I didn’t go too far outside the box and have ten gallons of really weird beer to drink. The wort was split between two yeast strains, Danstar Belle Saison and East Coast Yeast ECY08 Saison Brasserie (actually a blend of several saison strains). Both were fermented starting at 72F and allowed to free rise to 80F over the course of fermentation. Appearance. Somewhat hazy golden hue with a dense rocky head that persists. Much clearer than ECY08 version. Aroma. The Brewsers chose to have everyone dry hop their saisons, so the hop aromatics were definitely accentuated. That said, both yeast strains were still able to come through in the nose. The Belle Saison has notes of mineral, citrus, lemon zest, spiciness, somewhat fresh-cut grass, hay, earthiness, and noble hops. Taste and Mouthfeel. This version finished very dry (.996!) and with the extra carbonation was spritzy and refreshing on the tongue. The initial dryness is accentuated by yeast notes of black pepper, delicate smooth bitterness, and noble hops popping one after another. There is a distinct citrus note present, a lot of lemon and grapefruit. Overall Impressions. Very drinkable. This keg was gone (mostly from me) very quickly as it was my go to beer for a while. I like the not-so-complex layers of flavor that seemed to get out of the way of each other. This beer took a while to round out and after two months in the keg it was peaking, although it was almost gone at that point. Appearance. 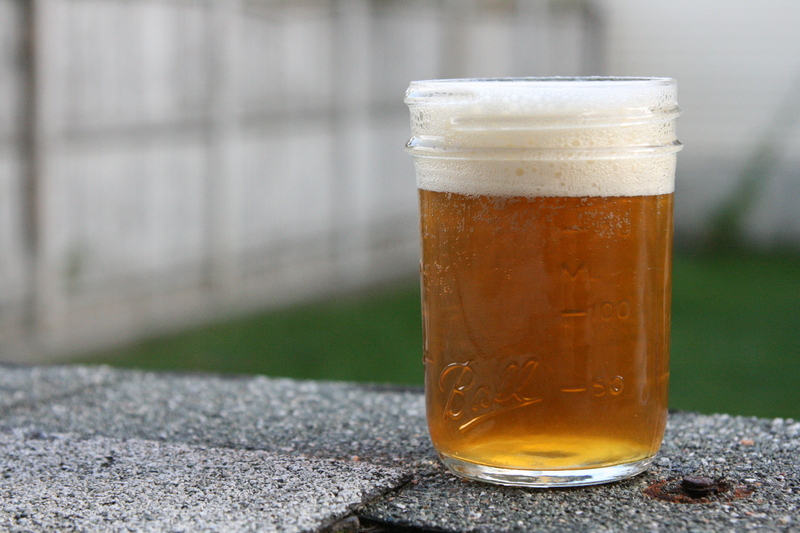 Same golden hue as Belle, but cloudy throughout its tenure in the keg. I knew it was going to be this way after seeing them both post-fermentation with Belle Saison forming a nice thick trub pile at the bottom of the carboy and ECY08 as cloudy as a hefeweizen. Aroma. Very noticeable barnyard, minerally, citrus, reminds me a lot of Saison Dupont. Lemons and grapefruit once again, most likely from the Crystal hops. Taste and Mouthfeel. While not as dry as the Belle version, this beer finished respectably dry at 1.001. Very spritzy and lively on the tongue as well, allowing the flavors to bounce around in your mouth. Lemons and grapefruit present as well as mineral notes that set this apart from the Belle. Grassy, earthy, and some spiciness, but mild compared to the black pepper present in the Belle Saison. Overall Impressions. This beer, even at an advanced age, was more coarse than the other version, making me think of the word “rustic” for some reason. Both beers took a while to come into their own, as is often the case with belgian-style beers. One of the most interesting things for me about this split batch was my wife’s surprised reaction when I told her that the beers were exactly the same recipe except for the yeast strains — despite having the same grainbill, hop and fermentation process, the flavors of the two strains and yeast-driven esters made two completely different (and totally drinkable) beers. 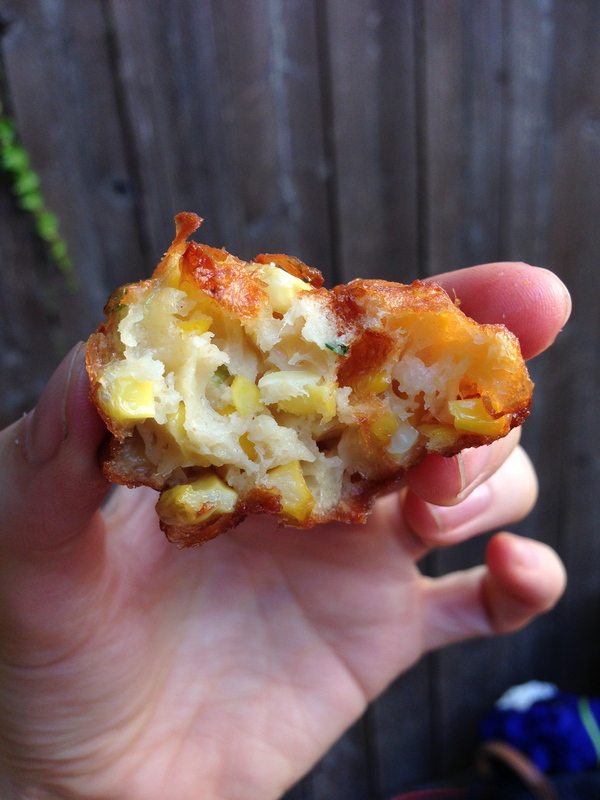 How many corn fritters constitute a full meal? This batch performed double duty in my homebrewery. It was initially a test batch for my brewery-in-planning, but it also served as a last minute entry into The Diamond Bar’s Brew ‘n Chew VI. 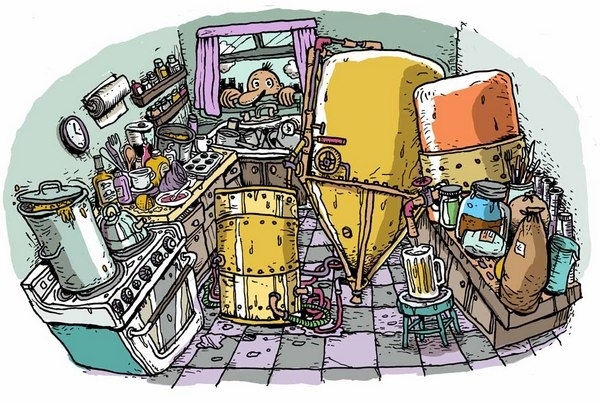 The idea behind Brew ‘n Chew is that teams of homebrewers each produce a batch of beer as well as an accompanying food dish. The general public buys tickets and then votes on the best pairing. Some of the ticket price goes back to reimburse the homebrewers, but a majority of proceeds goes to a charity selected by The Diamond. 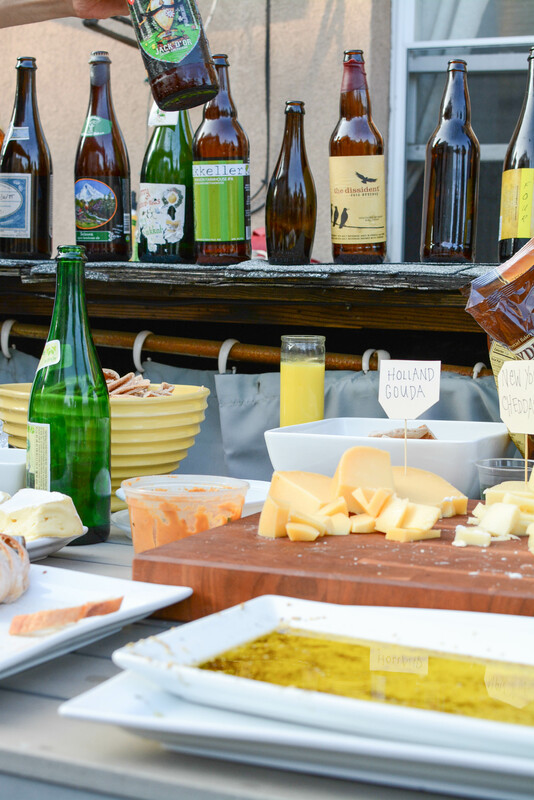 It’s always a good time and it’s fun to challenge yourself to think outside the box with beer pairing ideas. 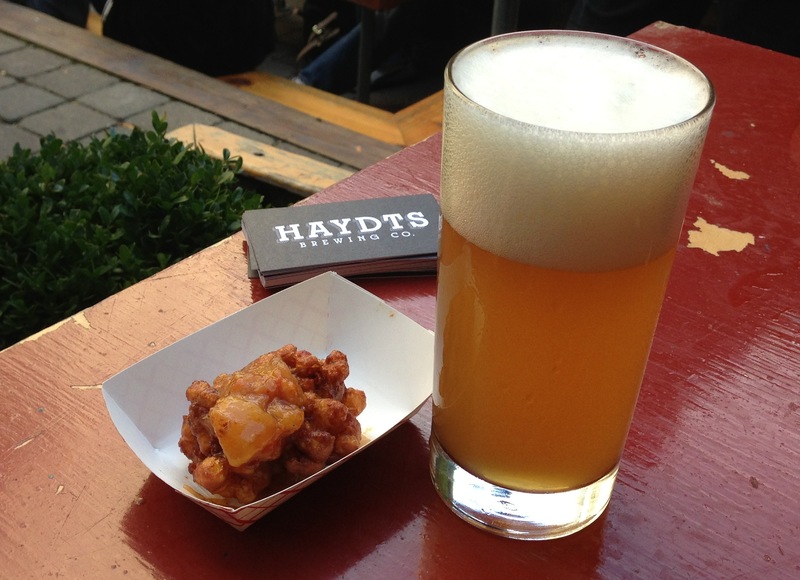 I paired a hoppy wheat beer with a sweet corn ricotta fritter with tomato-peach chutney. Let’s put a deep fryer near a bunch of drunk people! Plus a baby! The brew is inspired by hoppy wheat beers (Three Floyds Gumballhead, Boulevard 80-Acre, non-wheat-using-but-hoppy Carton Boat Beer) that tread the line between wheat beer and American IPA. I enjoy drinking these kinds of beers year round, not just their allotted Summer-seasonal release dates. I began with a simple grain bill (50% American 2-row, 50% White Wheat malt) and wanted to use two varieties of hops, preferably easily attainable and affordable so brewing this recipe will be commercially viable. I ended up using three hops, Bravo for bittering (because I have a few pounds in the freezer wanting to get used) and Centennial and Mosaic for aroma/flavor additions near the end of the boil as well as dry-hopping I also threw in a small dose of Bravo in the dry-hop just because I thought it would add some complexity. Appearance. Hazy deep golden hue slightly fading into orange. 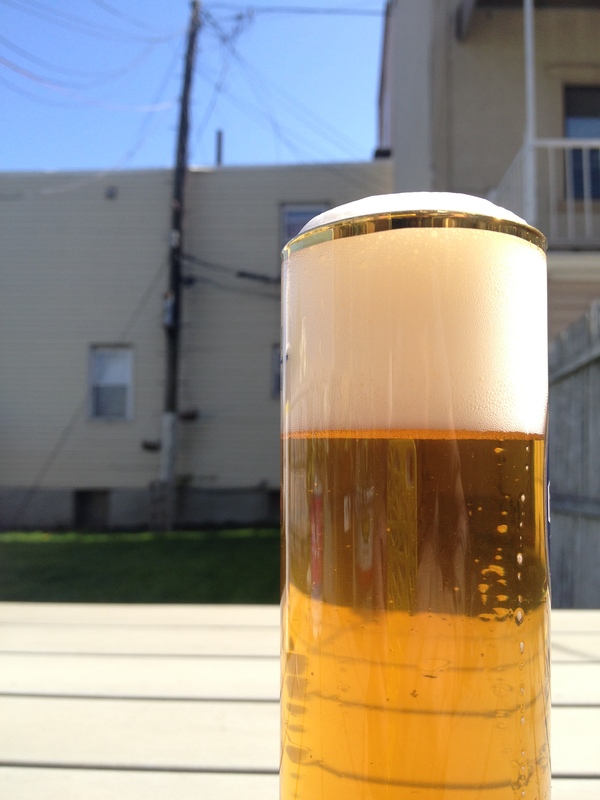 Wonderful pillowy head that left great lacing in the glass. Nice looking beer. Aroma. Orange peel, stone fruit, peach, apricot, cotton candy, geraniums, some grassy resinous notes. The Mosaic seems to play a complementary role rather than taking over the aroma, similar to how willamette hops work. Very enticing nose. Taste and Mouthfeel. The hop forward nose continues into the flavor, with citrus being the predominant flavor. The sweet peach notes also are present and follow behind. For my tastes, the mouthfeel could be slightly more full, possibly with a caramel/crystal malt like caravienne or c-20 but more than likely with a water chemistry addition of calcium chloride for palate fullness. 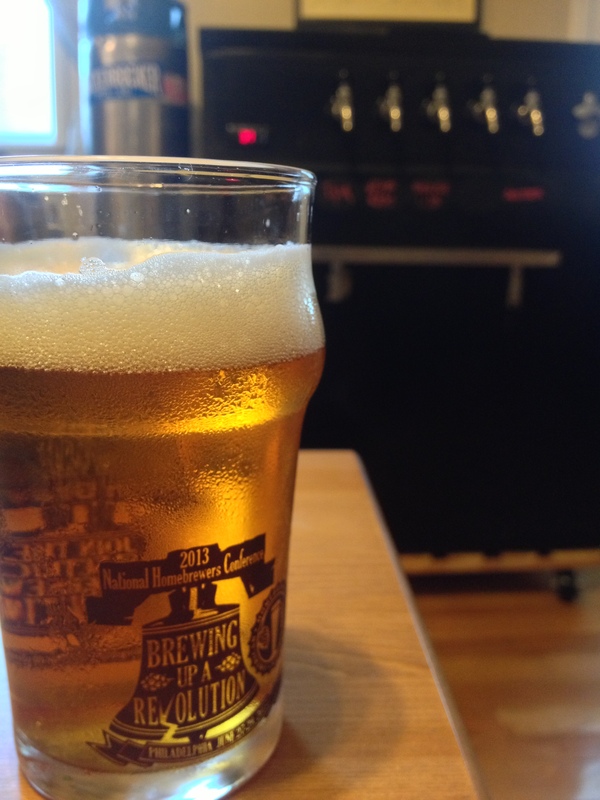 Carbonation is actually spot on despite always-too-foamy mobile draft setup. Overall Impressions. Very close to what I was trying to achieve with this beer, although I feel that the hop nose was a bit “boring” for me. By boring I mean that the classic centennial citrus/flowery nose isn’t as cutting edge hop-wise as I’d like to be. I think I’m looking for something new, extravagant, and unique, which is a conundrum because the other goal of this recipe is to be commercially viable. Mosaic was inserted into the recipe for uniqueness, but the cost per pound of this variety is so high that using it in much larger batches would be tough. It also didn’t make my beer stand out from other brews as I would have liked, so I may lower the Centennial amounts used and switch out the mosaic for another newer variety like Meridian, Belma, or El Dorado. Pairing Notes. The wheat beer paired very nicely with the delicate sweetness of the sweet corn ricotta fritter and the sweet-and-sour flavors of the tomato-peach chutney. The fritter was basically deep-fried batter so the sharp bitterness of the hoppy wheat beer cut through the fat nicely leaving your palate refreshed for another bite and had many people coming back for seconds (and thirds). Even though my team didn’t win, there is not much I would change about the pairing, besides a few minor quibbles about the beer (personal preference really). One hilarious side note about this event is that I mistakenly thought I used Glacier hops in place of Mosaic and discussed recipe notes and tips with brewers and non-brewers alike all day about the wonderful peach notes I was getting from the Glacier hops and how it really elevated an otherwise mundane hop profile. Amatuer hour. *Special shout out to Chris Prout for joining me at the last minute and lending a helping hand. Cheers! Next up in my single hop pale ale series is HBC 462. Got a hold of a few more experimental varieties and I’m trying to work my way through them. This batch was brewed in conjunction with Brooklyn Homebrew’s Hop Education Class which I recently taught. 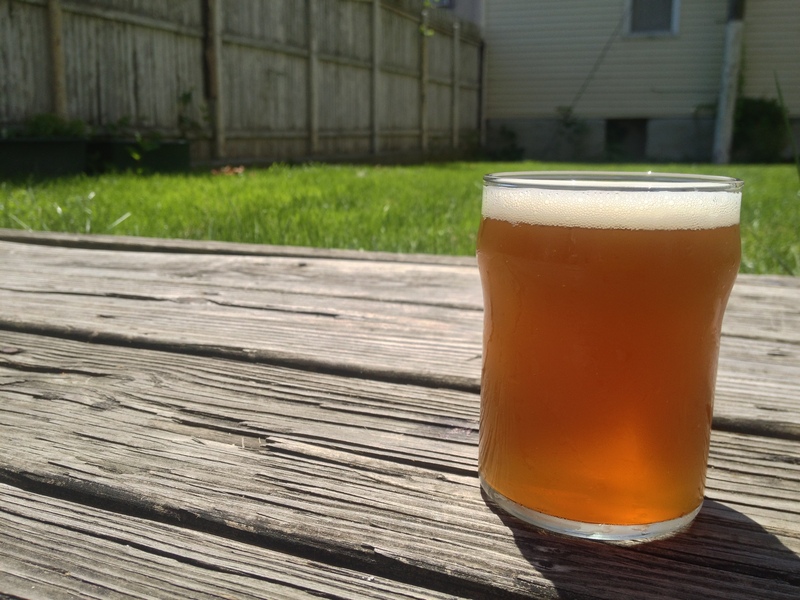 The class had to be rescheduled for a later date so the bright dry hop aromatics were a little lost after a few weeks in the keg, but I still got to taste is fresh and took some notes along the way. Recipe was once again Russian River’s Hop 2 It pale ale. Appearance. Standard pale ale color, copper orange with a brilliant clarity. Very good head retention. Aroma. Aroma never really jumped out of the glass like the previous iterations, but definitely unique. Smells sweet, some blueberry and grape, then herbal notes, green tea, and grass. Reminds me of noble hops a little. Taste and Mouthfeel. The grassy notes greet you upon the initial sip and I get a bit of noble hops. Harsh, astringent bitterness which means I would relegate this hop to later kettle additions, rather than using it for bittering. Overall Impressions. A very interesting hop, but doesn’t work well on it’s own, particularly in a pale ale. I could see this being a wonderful hop paired with a citrus powerhouse like centennial, cascade, or even Amarillo. This may even work well with another experimental variety, EXP 6300 in Belgian style ales. The harsh bitterness doesn’t dissuade me from making this my go to tap whenever I’m ready for a beer. 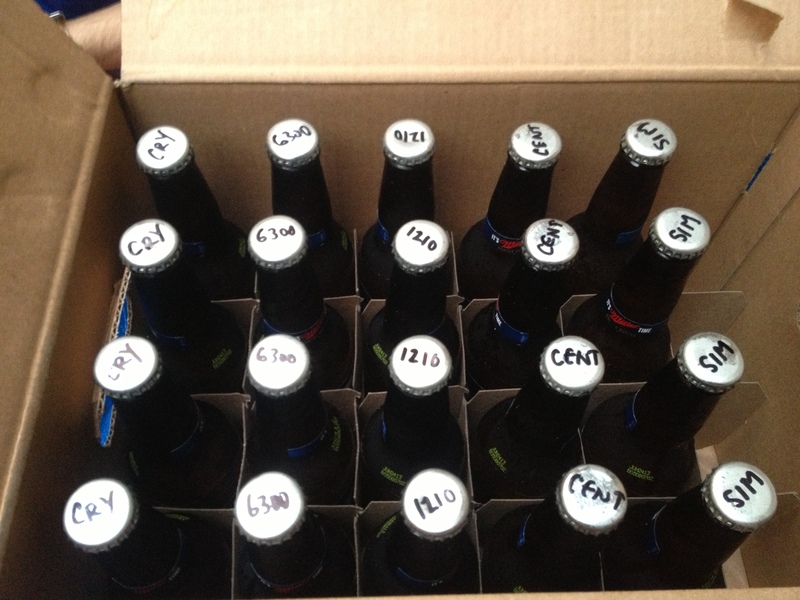 I was lucky enough to have Dmitri of BKYeast grow up a culture of his Cantillon Iris 2007 Brettanomyces strains (C1). Brettanomyces, while generally feared when brewing standard “clean” beers, is quickly becoming the darling of the (adventurous) brewing world. I thought I would further experiment and see what kind of flavors I could brew up. I chose to loosely follow an all brett witbier/saison recipe by Chad Yakobson in an article he wrote for Zymurgy recently. One of his suggestions was to supplement the grain bill with something brett couldn’t chew through (flaked rye, naked oats) in order to leave behind enough body and mouthfeel in the beer. My goal was to produce this beer in time for the National Homebrew Conference, but this strain had other plans. Primary fermentation took seven weeks to get down to final gravity and missed being ready for the conference. I was expecting a lower finishing gravity (1.008) based on my one other 100% brett fermentation (and a bit of research). With quite a bit of residual fermentables left behind I decided to bottle this batch in thick-walled corkable belgian bottles. Appearance. Hazy golden hue with very little head retention. Looks like a Belgian witbier. Aroma. Very pleasant aromas of hay, citrus, peach, mango, and a slight musty funkiness that isn’t off-putting. Very distinct brett aroma. Taste and Mouthfeel. Lemon verbena, sweet apple and pear notes with a slight astringency in the mouthfeel. There is a very cider-like quality to this beer. The brett has seemingly disassembled the malt profile of this beer leaving behind a thin to medium body. Carbonation is slightly lower than I think it should be, but I purposely used less priming sugar because of brett’s tendency to chew through everything. 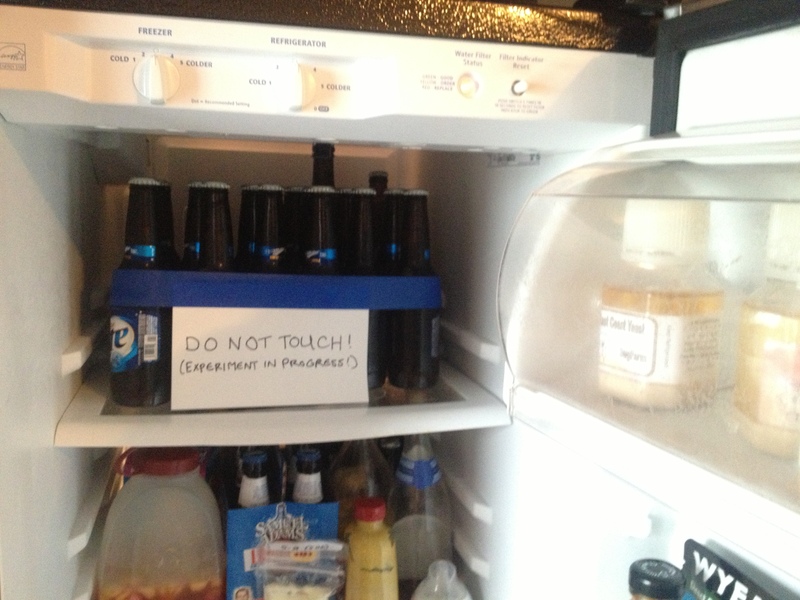 I plan to age a few bottles for a while to see how they hold up. Overall Impressions. Very appetizing beer that has grown on me over the few bottles I’ve tried. To me this beer seems like a hybrid of beer, cider, and wine. You’re never sure what to expect with brett fermentations and it is surprising that this beer is even drinkable considering this is a somewhat randomly sourced strain of brettanomyces. I recently read an article in Brew Your Own magazine where David Logsdon of Logsdon Organic Farmhouse Ales mentioned that he doesn’t find the flavor profiles of 100% brett fermentations desirable and so he’ll typically only use them in secondary, after primary saccharomyces fermentation. I tend to agree with him, but had to try it for myself. I am interested in brewing a 100% Brett IPA as the mingling of flavorful hops and interesting brett esters seems appealing. The low finishing gravity and minimal malt profile also seem in line with an IPA as well. I brewed a single hop beer a while back using another experimental hop from Hop Steiner, unostentatiously name “EXP 1210”. I fell back on the Russian River Hop 2 It recipe because of it’s ease of brewing, delicious results, and I had the ingredients readily on hand. I actually poured this beer at the most recent National Homebrew Conference in Philadelphia, and got some very positive feedback. Appearance. Looks spot on for a pale ale. Orange copper with nice lacing. I transferred this to a serving keg after using finings for clarity and it made the beer brilliantly clear, even after transportation to and from Philly. Aroma. Beautiful bouquet. I’ve never actually said that out loud but maybe I would for this beer. Really nice nose to it, plenty of citrus: lemon, grapefruit, orange, some strawberry, a little less blueberry, some stone fruit like peach or apricot. Taste and Mouthfeel. Slight caramel sweetness is nicely balanced by the smooth bitterness of this hop. Nice and dry. Many of the aroma notes carry over into the taste, but more generally citrus takes over for me, the sweet berry riding shotgun. Overall Impressions. Very drinkable. It’s not often that you get a single hop beer that can stand on it’s own. While I think this American pale ale could be rounded out a bit with some pine, resin, and dankness, I would be totally okay paying for this in a bar. I came to the conclusion that this hop was like a blend of 75% Cascade and 25% Amarillo. Much more impressed by this hop than the EXP 6300, but maybe I should give the 6300 a chance in a pale ale, as I heard Tasty McDole of the Brewing Network made a good IPA using that hop. It would be cool if this hop could stay in my own personal stash as a “secret” hop, but with a flavor this bangin’, I’m sure this hop will get a trendy name and be hard to come by in a few years. 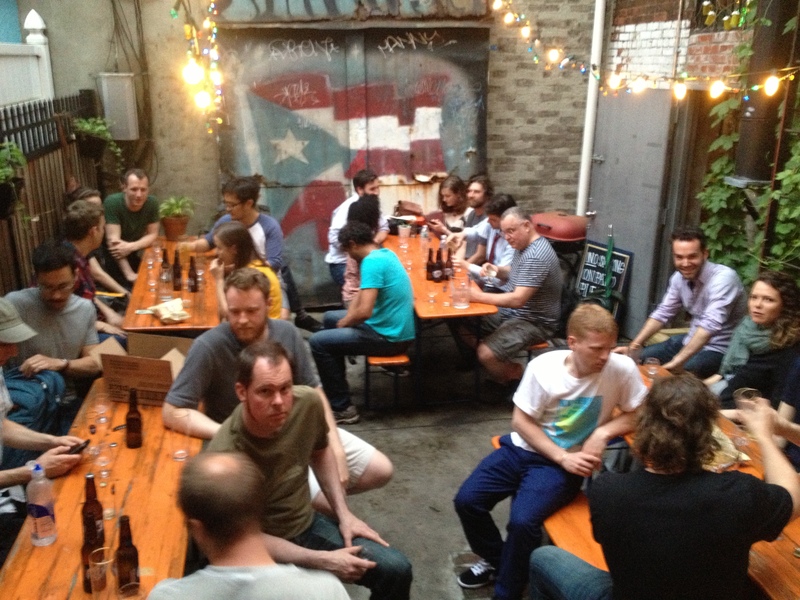 I performed another dry hop experiment for this month’s Brooklyn Brewsers meeting and wanted to report back with some of our findings. Used some pretty interesting hops with some even more interesting aromas. Galaxy: Strong aroma, floral, watermelon, pineapple, slight pear, touch of onion, pumpkin, cucumber, children’s vitamins, Overall: Good could be great. Palisade: Mild Aroma, Huge Tea note, black tea, earthly tea, earl grey, herbal, some blueberry and a little strawberry, okra, not as pungent as Galaxy. El Dorado: Strong aroma, lime, lychee, green mango, honeydew melon, kiwi fruit, sweet melons, juicy fruit bubble gum, orange. Very interesting and unique. Wakatu: Somewhat weak aroma, kimchi, beets, grassy, slight lemon, not very exciting, maybe old hops not stored well? Meridian: Full aroma but not powerful or overpowering, sweet, citrus, strawberry, rhubarb, strawberry daiquiri, blended fruit juice, lemon merigue pie. Very nice hop. Mosaic: Big Aroma, very complex, papaya, melon, some onion, juicy fruit, lemon rind, berries, chive. Hard to pinpoint exactly what’s going on thus the “complex” and “true to name” descriptors we heard from the tasters. This iteration was very fun and the next batch will hopefully be with some more classic varieties like Cascade, Chinook, Columbus so we can have some sort of baseline for all the unique new varieties and aromas we’ve been getting over the past two meetings. Hop Steiner recently released four experimental hop varieties (dubbed the EXP series) to homebrewers. I picked up two of the more interesting (to me) hops and brewed a couple single hop batches with them. For one batch I brewed Vinnie Cilurzo’s Hop 2 It single hop pale ale recipe (the subject of a future post), and for the other batch I brewed a single malt and single hop beer, a “SMaSH”. I have never brewed a SMaSH before, but I’ve tasted quite a few at homebrew meetings. The goal of a SMaSH beer is to learn what a specific ingredient brings to a finished beer without any extraneous flavors getting in the way. For my SMaSH, I chose Simpson’s Golden Promise malt because I had two bags laying around and I really enjoy the clean, slightly biscuity malt flavor. I use it often in my English bitter recipe and previously used it as the base malt for my house IPA before switching to American 2-row. I would characterize Golden Promise as somewhere between standard American 2-row (very clean, neutral) and English Maris Otter malt (more biscuit, bready). Because I had a good grasp on what the malt would taste like, I was better positioned to test out the new EXP 6300. There would be very few interfering flavors, as long as I got a nice clean fermentation. Appearance. Nice copper hue with a bit of haziness. Not sure where the haze is coming from as I usually don’t experience much chill haze and didn’t change my process for this beer at all. Still hazy after being in the keg for over a month at near freezing temperatures. Aroma. Things got weird. Most noticeable is coconut, pineapple, vanilla, and general tropical notes. Smells sweet, the combo of coconut and pineapple makes me think of piña colada and suntan lotion. Or the beach in general. Taste and Mouthfeel. Aroma of sweetness carries over into the taste, some grassiness, coconut and vanilla. Not a very harsh hop, smooth bitterness. Alcohol heat present, which is not the hop’s fault. Overall Impressions. This has lasted a while in the kegerator because this hop isn’t very enticing on it’s own. I also let the fermentation rise too high and created a noticeable alcohol flavor that took a while to fade. I haven’t done a SMaSH beer before, mostly because I feel single hop beers can’t really stand on their own, and this is no exception. I had good luck with HBC 342 single hop, but the character of the EXP 6300 is too simple and just isn’t tasty enough to warrant going back for multiple pints. I think pairing this hop with a standard citrusy American variety like Cascade would remind the drinker of a more classic hop profile and be easier to drink. Or maybe something like Simcoe or Citra for a general fruit hop bomb. Pairing with a more expressive yeast would be interesting, something like a German weizen yeast (banana, cloves) or saison (earthy, mineral, spicy) would make the beer more interesting by adding complexity. I’ve still got the better part of a pound left of these hops, so maybe one of those ideas will make it into the brewing schedule.